Earlier this year, Mercedes-Benz revealed the new V-Class. Slotting in below the popular Sprinter, the new V-Class replaced both the Viano and Vito upon its debut at the Geneva Motor Show. But Mercedes isn't quite done with it just yet. At the upcoming Caravan Salon in Düsseldorf, Germany, Mercedes will reveal the Marco Polo - a versatile, stylish and decidedly contemporary take on the classic camper van. Named after the famous Italian explorer, the Marco Polo was converted by Westfalia, an outfit which you might more closely associate with classic VW camper vans but which Daimler absorbed over a decade ago. Offering, according to the press release below, "a maximum of opportunities to be independent, free and spontaneous," the Marco Polo sleeps four thanks to the rear bench that electrically folds flat into a bed and the second berth under the pop-top. 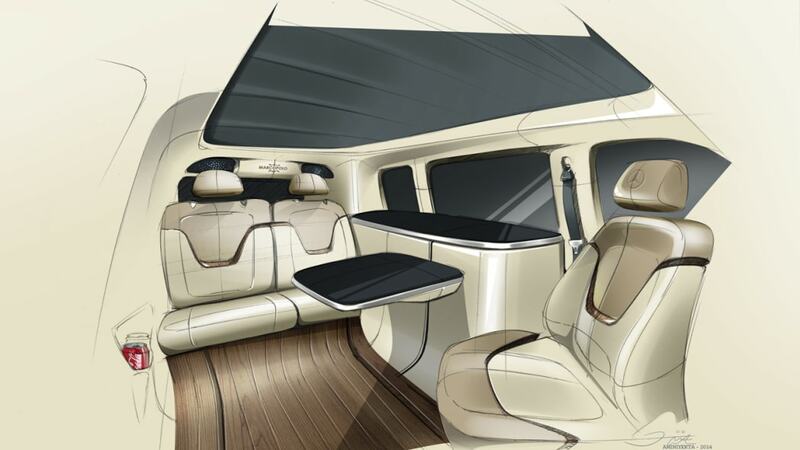 The flexible interior is decked out like you'd expect a modern Mercedes to be, with ambient LED lighting as well as wood, metal and piano black trim. It's got an onboard kitchenette with two gas burners, a sink and fridge with a 10 gallons of fresh water and an even bigger waste tank. All that gear is shlepped around by a choice of four-cylinder turbodiesel engines ranging in output from 136 to 190 horsepower. The relatively compact form boasts a turning circle similar to a full-size sedan and a height designed to fit into most garages and car washes. All of which just might make us reconsider the appeal of traveling by camper van. With the new Marco Polo, Mercedes-Benz is presenting a compact camper van at the Caravan Salon in Düsseldorf which combines maximum practicality with design appeal and stylishness. The interior impresses with its unrivalled feel-good ambience, outstanding comfort and high quality of appointments reminiscent of an exclusive lounge. 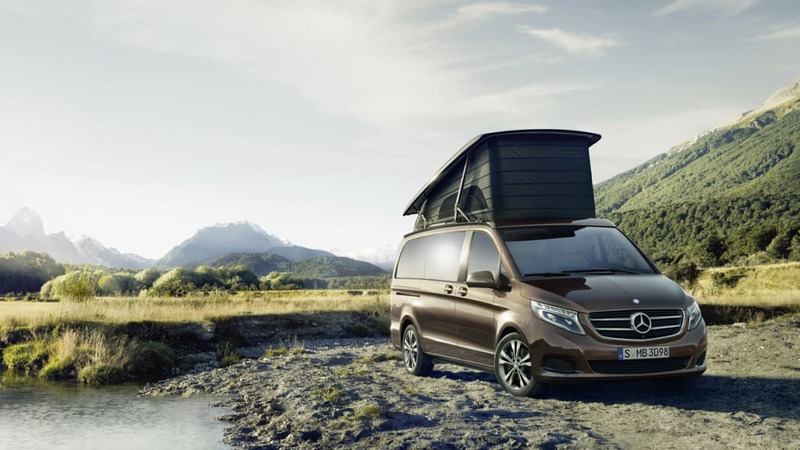 At the same time the Marco Polo developed in cooperation with longstanding Mercedes-Benz partner Westfalia convinces with its extraordinarily practical features – from the stowage facilities and seating/sleeping arrangements to the camping equipment for outdoors. The standard specification already sets new standards in the compact camper van segment with respect to perceived quality, homeliness and comfortable practicality. The new Marco Polo takes its body design from the V-Class, and offers in the interior high-quality materials finished to perfection, a harmonious colour scheme and a modern, timeless furniture design. 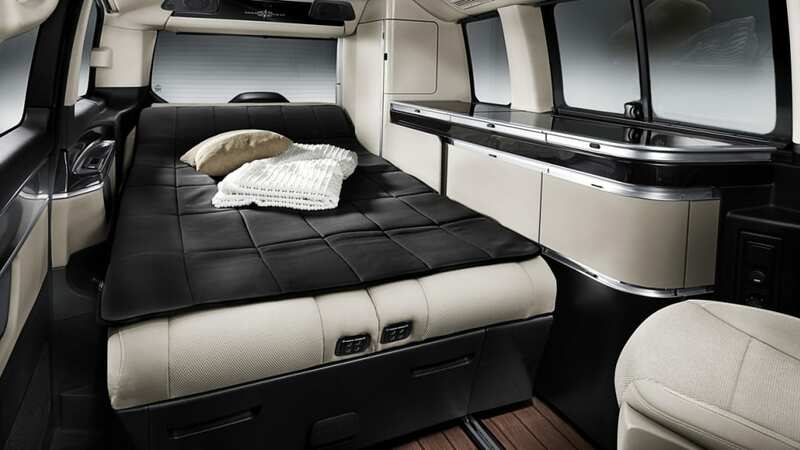 As a result the new camper van from Mercedes-Benz gives an impression of unexpectedly generous space. Thanks to powerful and efficient engines, a comfortable and dynamic passenger car suspension, exemplary safety, compact exterior dimensions and excellent manoeuvrability, the new Marco Polo is emphatically suitable for long journeys and at the same time for day-to-day and urban motoring. With these advantages it is the ideal vehicle for discerning individualists who wish to combine independence with maximum comfort and day-to-day utility. The compact camper van is ready any time – for vacation, spontaneous weekend trips out in the nature instead of staying in a hotel, for extended shopping trips with the entire family or even for driving to work. Therefore the Marco Polo offers a maximum of opportunities to be independent, free and spontaneous. The new Marco Polo combines impressive practicality with exclusive style. The headlining and side panels are in the colour porcelain, whose light tone emphasises the impression of spaciousness. The seats are upholstered in a choice of satin beige Santiago fabric, black Santiago fabric or satin beige Lugano leather. As standard, the floor covering is in a robust, easily cleaned yacht decking look which can be light or dark in colour to contrast with the chosen upholstery colour. The furniture is in a modern porcelain colour. An area of trim in a black piano-lacquer look contrasts with the light-coloured surface to create a homely ambience. 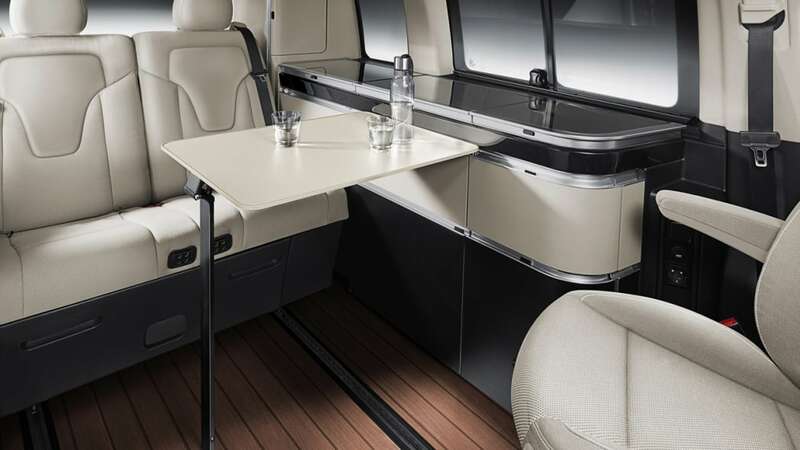 It extends from the kitchenette behind the driver's seat across the entire width of the cupboards and to the rear end, while in the front it continues into the dashboard. The living area and cockpit are thus blended into a harmonious unit. This inviting stylishness can be rounded off with optional LED ambience lighting along the lower edge of the kitchenette. Only LED lighting is used throughout the interior. Two large main lights, four reading lamps in the living area and two gooseneck lamps beneath the roof allow best illumination and lightness inside the camper van. The kitchen cupboard module consists of a large, self-closing drawer with extending worktop, two smaller, self-closing drawers which can also be opened when the bed is folded out, and a large stowage compartment with a sliding door. The two gasburners, sink and refrigerator have covers of easily cleaned, impact-resistant glass. Thus the transparency of the glass allows light through the window when the covers are folded upwards. The rear section of the passenger compartment has a large wardrobe with sliding doors, a clothes rail and an illuminated swing-out mirror. The folding table with a scratch-resistant surface is space-savingly attached to the kitchenette, and can be moved in and out on a sliding rail. It can therefore be perfectly positioned for up to four persons – two on the bench seat and one each on the driver and front passenger seats, which can be rotated by 180 degrees. When folded, the table is in a vertical position next to the bench seat. The kitchenette is fully equipped with two gasburners, a sink and a compressor refrigerator with a capacity of 40 l and a cooling output of up to minus 20 degrees Celsius. The fresh water tank has a capacity of 38 l, the waste water tank 40 l. Both are in the vehicle interior, where they are protected against frost. The two-seater bench in the rear can be repositioned on rails, and provides excellent lateral support thanks to electropneumatically inflatable side bolsters. The backrest is divided into two, and can be individually electrically adjusted on each side. At the touch of a button it can be converted into a single bed within seconds, or into a double bed measuring 2.03 m by 1.13 m. The electropneumatic system automatically recognises whether a seating or sleeping position is required, reconciling the conflicting aims of seating and sleeping comfort. The side bolsters are automatically deflated in the reclining position. When folded out to form a sleeping surface, the bench seat rises to conceal seat belt buckles that would otherwise disturb sleep. The bed extension can also be pivoted upwards to form a comfortable headrest. There is another bed with unrivalled sleeping comfort under the pop-up roof. This luxury roof bed measuring 2.05 m by 1.13 m consists of a high-quality foam mattress and a slatted frame of special elasticated spring elements offering outstandingly ergonomic sleeping comfort right to the edges. A pro­tective net can be attached to the front edge to safeguard children. On request the pop-up roof of glass-fibre reinforced plastic (GFRP) with a concertina of opaque, waterproof woven fabric can be equipped with a newly developed, particularly quiet electric drive. Thanks to an innovative scissor-action system, the pop-up height in the rear area is considerably greater than in the previous model, and provides particularly generous legroom. When the bed is not in use the slatted frame can be folded upwards when the roof is up, providing pleasant standing room in the interior. Other highlights included as standard are an electric vent window on the rear right, black-tinted glass in the rear for protection from prying eyes and heat build-up from solar radiation, and roller blinds in the rear. To darken the interior completely, the Marco Polo also has a curtain for the windscreen and front side windows. Two camping chairs and a table for use outside offer additional independance. When they are not in use, they are stowed in a bag within the luggage compartment under the bed extension. For loading and unloading convenience, the new camper van is optionally available with a separately opening rear window in the tailgate. The electric EASY-PACK tailgate is also available as an option. Numerous active and passive safety systems ensure exemplary safety and a high level of travelling comfort. Standard safety features include windowbags and thorax-pelvis sidebags for the driver and front passenger, as well as Crosswind-Assist and ATTENTION ASSIST, which can warn against inattention and drowsiness. The optionally available Active Parking Assist makes parking the new camper van as easy and convenient as a compact car. Other features available on request are the reversing camera, 360-degree camera, Blind Spot and Lane Keeping Assist, COLLISION PREVENTION ASSIST and the LED Intelligent Light System. Most of these assistance systems are available for the first time in this segment. The new Marco Polo combines stylish living with the ride comfort and dynamics of a passenger car. Ultra-modern four-cylinder turbodiesel engines in three output variants (100 kW, 120 kW and 140 kW) make for efficient driving pleasure. The Marco Polo 200 CDI develops 100 kW (136 hp) and a maximum torque of 330 Nm. The Marco Polo 220 CDI generates 120 kW (163 hp) and 380 Nm. With fuel consumption of just 6.0 l per 100 km and CO2 emissions of 158 grams per kilometre, the Marco Polo 220 CDI occupies an absolute leading position in the segment. The top engine variant with 140 kW (190 hp) and a powerful maximum torque of 440 Nm consumes just 6.1 l per 100 km. In the acceleration phases, an additional 10 kW and 40 Nm are available ("over-torque"). As a result, the flagship model briefly develops 150 kW and maximum torque of a full 480 Nm. The electromechanical power steering included as standard is speed-sensitive, and has a variable steering ratio. This ensures extremely easy slow manoeuvring, great agility in urban traffic and reassuring stability at higher speeds. With a turning circle of 11.8 m, the 5.14 m long camper van is more manoeuvrable than many luxury-class saloon cars. The comfort suspension included as standard also helps to ensure that the Marco Polo drives as comfortably and precisely as a passenger car. And with a height of 1.98 m it is able to enter all normal garages, multi-level car parks, underground garages and carwashes. Which means that the nearest towns can also be conveniently explored while on holiday. The new Marco Polo can be ordered in Germany from 29 July 2014.